Free play and building with logs and boards is a realistic way to explore physics concepts. 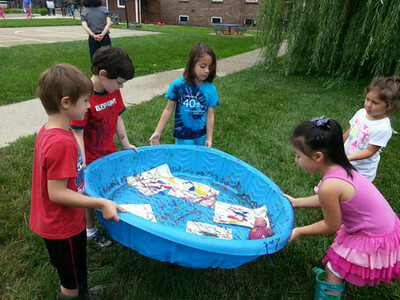 MSGL has an outdoor space that allows for more than just "recess." Outside time is not a chance to get away from the classroom, it's an opportunity for children to use their whole bodies to learn and, most importantly, have fun with friends. On Thursday, a quartet of boys was getting very silly in the back corner of our Montessori classroom. They were speaking with outside voices and using all available paper to make pretend swords so they could have a pretend swordfight. When I tried to redirect them, they asked to make paper airplanes and see whose would fly the farthest. Although Montessori teachers are known for their flexibility and laid-back grooviness, I could not condone sword-fighting and airplane-flying during class on this, only the second full week of preschool. What would people say? I empathized with these friends because they wanted to play together and needed to actively move their bodies, but it was still 30 minutes before we (read: I) could even think about going outside where this type of gross-motor play was appropriate. They took a half-hearted interest in another activity and I sat at a table nearby to observe. When they realized I was there to stay, they started putting away their work and chanting with dead eyes and sad voices, "No more fun. No more fun. No more fun." It would seem I had officially become "the man." They went to the other side of the room to build a tower with the brown stair and the pink cubes and within minutes, they were using the smallest brown stair as a lever to launch the smallest pink cube across the rug. Clearly, they were trying to tell me something. What these boys wanted was action. They are perfectly willing to come in each morning and work on their maps or practice writing their names, but after a time they really want to make things move. And it's not just the boys, of course. 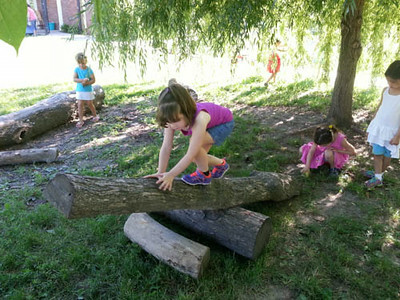 Girls thrive on kinesthetic learning activities and they are usually the first to line up to walk across the log seesaw. No one is suggesting that preschoolers should be taught through lectures, but sometimes society (or maybe our high school principal's voice in the back of our head) worries us into thinking that if we don't make our children sit down, concentrate, and learn - how will they ever be successful in school or the Real World that supposedly comes after? Maria Montessori observed that not only do young children learn kinesthetically, they absolutely MUST learn this way for proper brain development. 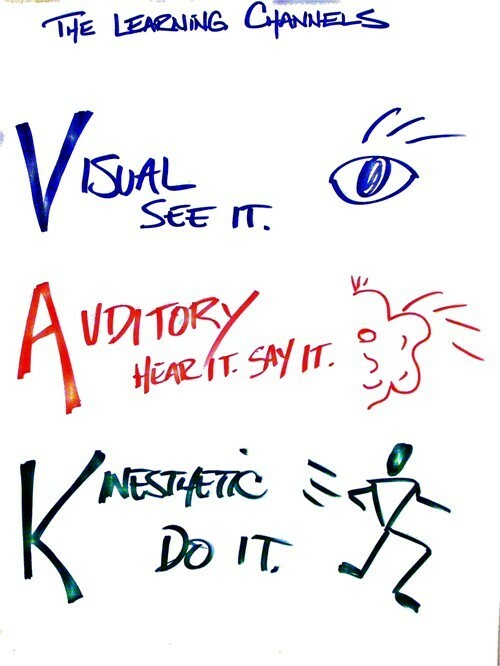 So, as a good teacher who believes in a research-based approach to education, I am obligated to consider the kinesthetic learning style of my preschool students. I am also obligated to follow a child's interests because a child who is studying something she is interested in, as opposed to an externally-imposed curriculum, is much more likely to retain that information and build connections in her brain. So why were we still inside the classroom and NOT outside studying the physics of flight and simple machines? Because I didn't know they were interested until Thursday. But now I do. As a result, my assistant and I will be following our 3, 4, and 5-year-olds into the action-packed world of physics this week starting with the simple lever. 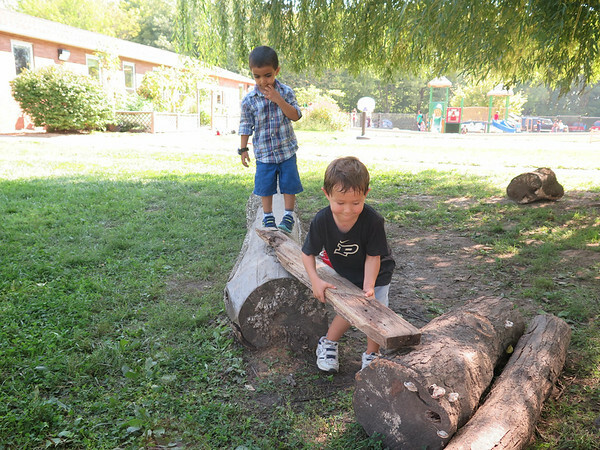 We will spend a little extra time outside on the log seesaw for some major gross motor exploration, then we will scale down the kinesthetic experience to make smaller levers inside the classroom using blocks, rulers, pennies, rocks, and pompoms. We will introduce the appropriate words such as "load", "effort", and "fulcrum" and we will figure out how many pennies it takes the raise the rock load. I will do my best to be fascinating. There may be squeals of joy and pompoms flying through the air, but no more "No more fun." The weather forecast calls for all of this snow to be melting in about a week. In case you think you just can't wait that long, here are some photos of MSGL summers past to see you through. 1994 - Digging in the tiny sandbox at Morton Center. 2000 - Hula hooping at Morton Center. 2002 - The Parent/Infant class posing by the sandbox. 2003 - Waiting for a wagon ride. 2009 - Sack racing at the family picnic at Happy Hollow Park. 2010 - Releasing a newly-emerged Monarch butterfly. 2011 - Summer camp besties. 2012 - Shoveling in the shady sandbox. 2013 - Gardening at summer camp. It will only be a few more days until warmer, friendlier weather arrives. Until then, take heart! Spring never fails to arrive. We're keeping things simple on Wayback Wednesday this week with a short and sweet little collection of photos from October, 2002. Teacher Judy West took the children of the Red Oak class on a nature hike to Purdue's Horticulture Park to enjoy the crisp morning, collect leaves, and hug some very deserving trees. Berries for collecting, not for eating. Waiting for the chipmunk to make an appearance. Do you have favorite photos you would like to share on Wayback Wednesday? Please contact me at heather@msgl.org. Have an outstanding Wednesday! 1. Check the forecast. Every class - Toddler through Elementary - goes outside when the temperature is 20 degrees Fahrenheit or above. Check the weather forecast each day before leaving the house to make sure your child will have the appropriate cold-weather gear for that day. 2. Go with the low. Consider the time of day your child will be outside. The forecast may call for a high temp. of 63 degrees, but the temperature at 8:30 am might only be in the 40's. Some classes start outside, some go out at 10:15, some at 11:00. The afternoon and Elementary classes go out at varying times throughout the week. Provide clothing for the day's low temperature and your child should be well-prepared. 3. Layer, layer, layer. Imagine your child as a cute, rosy-cheeked onion and help her dress in layers. Being hot and sweaty outside in the cold is just as uncomfortable as shivering. If your child can take off a sweater or push back her hood and unzip her coat, she will be able to regulate her body temperature and still enjoy the time outside. 4. Listen to your child. Trust your child to make decisions about his comfort. The only way we can learn if we are too cold is if we are allowed to feel the cold. If your child doesn't want to wear his gloves, don't sweat it. Make sure he knows his gloves are in his locker and that he can go get them if he gets cold. The same goes for his snow pants and his bulky winter coat. An active child dressed in layers with warm shoes and a hat can generally enjoy himself outside without danger of getting too cold, even in winter. If your child is listening to his body instead of chafing under a "mitten mandate" he is more likely to develop a true sense of how to dress for the weather. My friend "Z" always told his dad he didn't want to wear his coat or his snow pants or his gloves, but 10 minutes after dad left, Z would ask to go get them. 5. Start a discussion. Talk with your child about the day's weather and how to dress. Remember that the ultimate goals are safety and independence. You might say something like, "It's 30 degrees Fahrenheit. You definitely need to wear something on your hands, but you can choose if you wear your Spiderman gloves or the mittens Grandma made for you." Or try, "It's going to be 45 degrees when you go outside today. What should you pack for school?" Young children can learn to speak three languages at once. They can also learn to make clothing choices based on the outdoor temperature. 6. Get a move-on. Remember that your child is most likely playing actively outside. We might feel very cold walking from the car to the school door in a suit or a skirt and heels, but a child riding a balance bike for 10 minutes heats up very quickly. 7. Consider cold pants. Snow pants or snow suits are essential when there is snow on the ground, but some children (and some preschool teachers) like to wear them as soon as they can see their breath outside. Think of them as "cold pants" and let your child keep them in his locker from October through April. 8. Label everything. Speaking of lockers, our lockers are small. When two children share a locker it's nearly impossible to fit snow pants, coats, book bags and lunch boxes inside. PLEASE make sure every article of clothing you send to school has your child's name or your family's last name written on it where it's easy to read. All black snow pants and all Spiderman gloves look the same when there are 24 children getting dressed in the hallway. If you forget, your child's teacher will be happy to loan you a Sharpie and some masking tape. 9. Embrace the terrific outdoors. Spending time outdoors is important for everyone's health and well-being. We do not have a gym and children may not stay inside by themselves. If your child is recovering from an illness and you don't want her to be outside, please make arrangements to drop her off late or pick her up early, depending on the class schedule. 10. Stock up. Have extra winter clothing on hand, if possible. The first Snow Day of the year is much less fun when your child has left her snow pants at school. And plan to lose at least one set of gloves. If you buy three identical sets of gloves, odds are you will have at least one matching set at the end of the year. Just in case, the Lost and Found box is in the office. If you recently moved to West Lafayette from somewhere warm and lovely, I am so sorry! But seriously, you can stock up on all the clothing your family needs to get through your first Indiana winter at J.C. Penney, Sears, Target, KMart, or Walmart. You can purchase gently-used childrens' outerwear at Once Upon a Child in Lafayette. Below are some examples of items your child will need. Thanks for reading and bring on the snow! This post was originally published on September 24, 2013. Two years ago, before their daughter was even old enough to enroll at MSGL, Zoe Neal and Desiree Chuang made an historic donation to our school. Owners of Virtuous Cycles in downtown Lafayette, Zoe and Desiree gave us a bright orange Strider balance bike to try out on the tricycle track. It soon became the most beloved of all the bikes because it is the only two-wheeler and it has no pedals. And most importantly, it goes FAST! Well, it goes as fast as the square bike track will allow and with all of the tricycle traffic? The bike track is sometimes more like the intersection of 52 and Salisbury when Purdue heads home for the day. Still, it feels really fast. On the bikes of my youth and quite possibly yours, I learned to pedal with a set of training wheels attached to the hub of the back wheel to keep the bike, and me, upright. I learned to pedal the bike but never felt what it was like to be truly balanced on two wheels. When the training wheels came off I wasn't really ready at all. I had to learn to balance, and quickly! - and my parents had to watch. Spoiler alert: we all survived. The author with her first set of wheels. Balance bikes let a child master the balancing part - the most challenging part - of riding a bike, first. When you are coasting on a Strider bike with your feet not touching the ground it feels exactly like riding a bike. You ARE riding the bike, you're just not pedaling it. 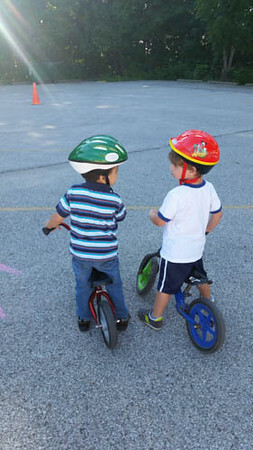 And since many children already learned to pedal on a tricycle the year before, the two skills of balancing and pedaling come together nicely after they have mastered the Strider. Several online reviews point out that if a child can walk she can ride a balance bike, so some children skip the tricycle stage altogether. 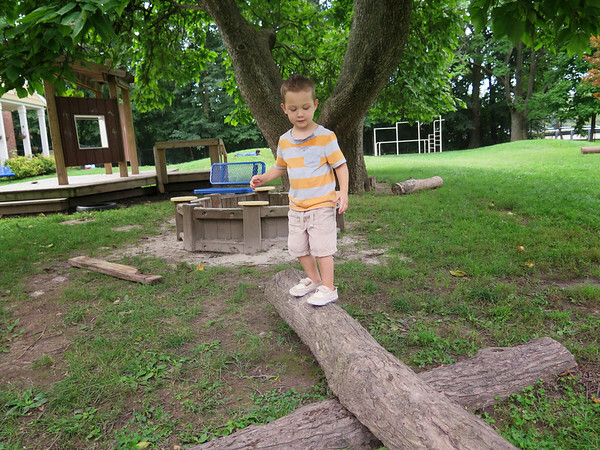 Maria Montessori observed the importance of a child developing his sense of balance. She created activities such as walking on the line to help fine-tune this sense. At MSGL the Strider is an extension of that balance exercise. Last year, the Franklin family donated a new, dark blue Strider and now the children can have a turn to ride in half the time. That's important because learning to have a turn and to wait for a turn is one of the biggest works of preschool. The children at MSGL and their teachers have come up with an almost fool-proof system for taking turns on the Striders and all the bikes. It came to be called the "waiting bench." Miss Angie and friends on the waiting bench on a cold, cold day. The waiting bench is right next to the bike shed which is sort of the starting line of the bike track. The first two children take the bikes out of the shed and ride them. When another friend wants a turn, he sits on the waiting bench. This signals the riders that someone is waiting for a turn so they need to consider how many more laps they will take before handing the bike off to the next friend. Sometimes the rider stops riding and negotiates with the waiter. Waiter: How many more times are you going to go around? Waiter: That's too many! How about 7? Once an agreement has been reached, the rider continues his laps while the waiter and his friends count down from 5 to 1. At the hand-off between rider and waiter, the cycle is repeated with new riders. Sometimes there are misunderstandings and an experienced child steps in to mediate. A teacher is always nearby to see what is happening and make herself available to help, if needed. The idea of the waiting bench just sort of happened, like lots of great things happen in child-centered environments. It's possible that the teachers could have made an arbitrary rule about each child getting only 5 turns, but that would diminish the child's ability to make choices and consider the feelings of others. For example, 5-year-olds can recognize a child who is struggling with being patient and they will sometimes hand the bike over early to help this child. This leads to another cycle that I call the "Cycle of Benevolence." Benevolence is an inclination to perform kind, charitable acts. When a child sees a peer giving freely of herself to make someone else happy, it feels good. Soon, that child is looking for a way to help a friend. The cycle repeats and those kind acts and good feelings spill over into the community and, ultimately, the whole wide world. Heike Larson, an administrator and blogger at Leport School in California, writes frequently of the importance of fostering benevolence in preschool communities. All of us at MSGL are inspired by her blog. She has also written about balance bikes on the Leport Schools blog here. If you are considering buying a balance bike for your child, be sure to visit Virtuous Cycles to check out their selection of models and colors. Tell them MSGL sent you and be a part of the Cycle.